Special Offer. Buy 2 Bottles for £235.00. Save £20.00 !! Single Bottle Price - £245.00. Light and floral on the nose, with hints of wild strawberry, raspberry and forest fruits. Fresh, yet silky and balanced on the palate with excellent ageing potential. 45% Chardonnay mostly from Cramant and Avize. 50% Pinot Noir particularly from Mailly and Verzy. 5% Pinot Meunier. 8% red wines from Ambonnay and Aÿ were added. For over two centuries, Maison Perrier-Jouet has continually pursued its quest for quality. 1811 is not just a legendary vintage, it is also the year that Nicolas Perrier, the son of winegrower, Adèle Jouët, the daughter of a family of wine merchants, went on to create a major champagne House. The combination of tradition, "terroir", know-how, and a love of work created a champagne with elegance and finess. Lying in the heart of the champagne region, Perrier-Jouet owns 65 hectares rating 99.2% on the quality scale (100% being the optimum). This means that each vineyard parcels is classified almost exclusively as Grand Cru. The Chardonnay grape, floral and almost feminine in its elegance and finesse, is the signature variety of Perrier-Jouet's vineyards, with a strong showing of mature vines (23 years old on average). The holdings take in a homogenous terroir of Chardonnay vineyards some 40 hectares in area within the legendary Grands Crus of Cramant and Avize. Two parcels enjoy almost mythical status - Bourrons Leroy and Bourrons du Midi. 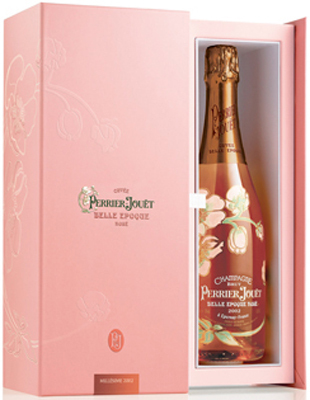 From its early days, the House of Perrier-Jouet has made champagne in small quantities with a "limited edition" approach. Like master craftsmen handing down the secrets of their trade from father to son, the seven Chefs de Cave over two centuries have placed quality before quantity. They have also managed to conserve the House's historical treasures in the shape of its early vintages, such as the Perrier-Jouet 1825, the oldest left in Champagne today. Hervé Deschamps, the current Cellar Master and guardian of this heritage, is a natural upholder of this creative philosophy.